With each new generation of publishing software for e-books, options for typography, continues to expand. And as with any industry, there is language specific to that technology in the field. AuthorMichael N Marcus‘ book Typogr aphy for Independent Publishers is a reference book that helps authors understand language such as fonts, serifs, outlining, embossing and other words that may be unfamiliar to those who are new to the publishing world. Typography for e-books is quickly becoming an art. Since the initial offerings of e-books, readers are becoming more discriminating in what they want to see in e-books. Good layout, formatting and cover design is important for hard and soft cover publications and also for e-book buyers. Understanding typography terminology will help authors determine what they want to incorporate in their finished product. No need to worry that you don’t have room for one more book on your bookshelf. 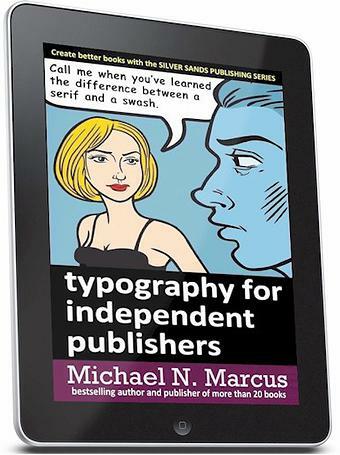 Typography for Independent Publishers comes in e-book format, and it can be referenced from digital handheld devices from anyplace, anytime. Check it out! Visit us again tomorrow on All Things Fulfilling, where sharing independent thoughts, words and views is all part of the business. This blog is brought to you by www.CornerstoneFulfillmentService.com. Since this original blog was posted in February 2013, there have been more advances in e-book typography and layout. It’s an exciting digital world we live in.